Carrots braised in a sweet buttery broth, flavored with orange and served with a sauce made from the carrot tops. 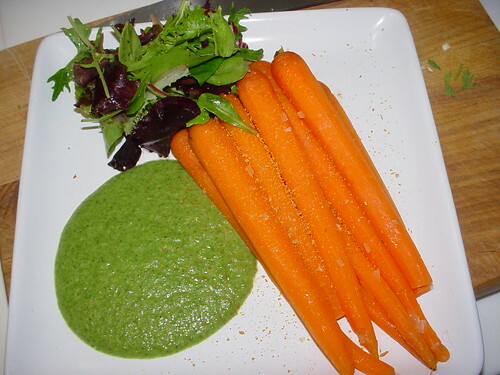 The idea of cooking carrots and serving them with a sauce made from those green tops that usually end up in the bin is so damn intriguing to me. I’ve attempted to use those green tops before, I tossed them in a salad once. Unfortunately they are too tough and are not so good for eating raw. Now, blanching them and pureeing them into a sauce is genius! I am getting ahead of myself here, so I’ll start from the beginning. I had a nice bunch of organic carrots with the tops all nice a green. I separated the tops from the carrots. 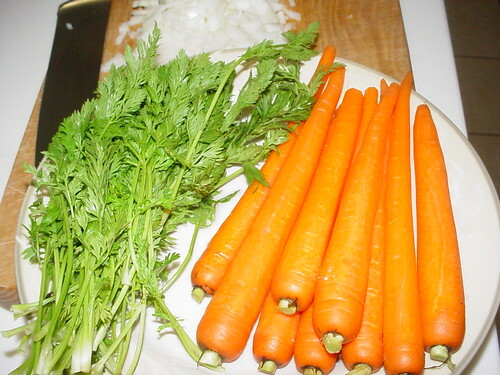 I peeled and trimmed the carrots and I washed and picked the leaves from the tops. The first step in the recipe is to make some dried, pulverized orange peel to be used as garnish. Well, I did not do that. Not because I was not planning on using any but because I was on a time crunch (weekday dinner) and because I had some excellent home-dried orange peel in my pantry already. But for those who don’t the process Chef Richard outlines involves blanching the peel in boiling water and drying it in the oven for 24 hours. He does say that the drying can be done in the microwave for a few minutes and I would like to try that sometime. For now, I just pulverized some of my dried orange peel in my heavy Thai mortar, and I am good to go. For the carrots, I simmered them in a mixture of orange juice, stock, butter, onions and some sugar. Here Chef Richard is definitely off on the timing. They took about 15 minutes longer than the 15 minutes stated in the recipe to get cooked through. They ended up soft, not a trace of a crunch, but definitely sturdy and not mushy. They ahd a bright orange color and a lovely glazed sheen, in other words perfect carrots. For the sauce, I first blanched and shocked the leaves in ice water. 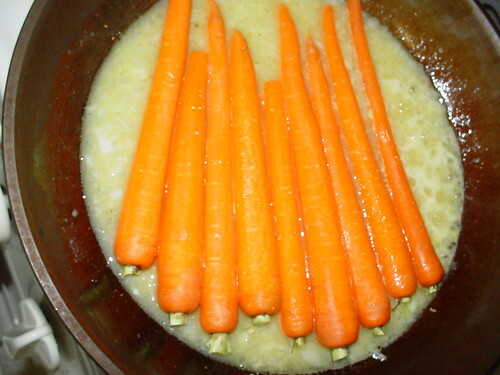 Then I pureed them with butter and with the reduced cooking liquid of the carrots. Seasoned this with salt and pepper and got ready to serve. Chef Richard specifies mache to serve with these. I can see why. Mache will resemble the tops on the plated carrots, as you can see in the picture in the book if you have it. I could not find mache in a couple of stores that I visited, so I used some baby salad greens instead. I placed the carrots on the plate first, I tossed the greens in some very simple vinaigrette (olive oil, vinegar, salt and pepper) and placed them right next to the stem end of the plated carrots. The carrot-top sauce goes right on the side and the pulverized dried orange peels gets sprinkled on top. I am so looking forward to making this again. It was absolutely delicious. The carrots were cooked perfectly and a bit on the sweet side (that can be modified by reducing the amount of sugar). The sauce was velvety smooth and had a sharp carrot flavor that worked so well with the sweet cooking liquid in there. If you want a lovely carrot dish and are tired of the good old glazed carrots, then give this one a shot. the combination of carrots and orange sounds so good! love the last pic! BTW, i was able to find mache at the Signature Kroger’s in the Heights.